I have to say that I am an easy lay as far as unusual design goes in books, as long as it isn’t too far off the wall – and 101 Golden Rules has exactly the kind of layout that turns on my lights. As a book, it is a kind of cross between Mr. Crabtree and an acid trip, the emphasis being on Crabtree, because more than anything else, Rob Beattie’s book is a book for beginners. The text is presented in a very readable format, almost like a personal diary, and is perfectly complimented by Matt Pagett's illustrations. For some reason there never seem to be enough books on how to get started fishing, particularly at coarse fishing, which most magazines make out to be a complete black art, with pages of uninformative reviews of rods that even the writers find difficult to tell apart. 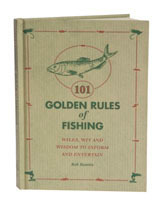 I’m not saying that you can pick up 101 Golden Rules and become an expert coarse fisher – you will need to read something else as well – but as a source of inspiration, you could do a lot worse. And even if you know enough to get by, Rob’s book has plenty of stories in it and is just so likeable it isn’t going to get left in the loobrary, because I know a visitor will nick it.